A woman with extreme constipation whose friends said was "suffocating in her own poo" has left hospital after a "breakthrough" in her treatment. Kelly Yeoman left Southmead Hospital in Bristol two months after complications developed from surgery for suspected endometriosis at another hospital. Her friends had raised almost £11,000 for her to be moved to a specialist unit but the move proved unnecessary. Ms Yeoman hopes she can now use the funds to assist in her recovery. However, her friend Kate Rankin said donors wishing to be reimbursed, could be. Ms Yeoman, 34, from Cadbury Heath, posted an update about her treatment at Southmead Hospital last week. "They were able to remove all of the impacted and constipated stool," she said, adding it was a "massive relief". She said her consultant was "very confident that, providing I came off all pain medications and continued laxatives, I would regain full use of my bowels." Ms Yeoman was initially admitted to St Michael's Hospital in August to check for endometriosis. She was later treated at Southmead Hospital when complications developed following the previous surgery. 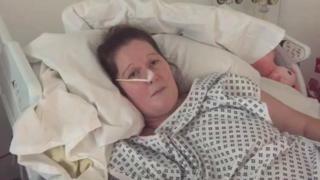 St Michael's said it had not received concerns or questions about her care at their hospital. Ms Yeoman wrote that because she was "now potentially fixed" she would no longer need to be transferred to the specialist unit at St Mark's in London. However, she said she would like to be able to use the donations to fund other care options. These include a private ambulance, overnight care unavailable on the NHS and "any adaptations I may need to make my home safe". A GoFundMe spokesman said: "We've been working with the campaign organiser to make sure donors are aware of the change of use for the funds." Ms Rankin said her friend had since been admitted to a hospital in Bath with an infection.